Coming in 2014: A more conservative Tiger? Buried in a blog post about his outlook for 2014, Tiger Woods offered a little insight into his mindset about his golf game these days: he tries to "tone everything down" and "play within myself." Taking a look at his offseason, Woods was writing about the upcoming winter Olympics for which his girlfriend, skiier Lindsey Vonn, is preparing to compete. He noted some similarities and differences in their athletic careers. "We both work very hard and are prepared for our seasons. And when we’re ready to go, we give it everything we possibly have and there’s no holding back. I think that’s some of our commonalities," Woods wrote. "But she has to be way more aggressive in her sport than I have to be in mine. You’re trying to make your way down a mountain at 80-plus mph, and you have to have the adrenaline and the aggressiveness to do it. But for me, I’m trying to tone everything down mentally. I’m trying to play within myself and do all the little things." It’s perhaps a departure from his often aggressive style of play, but it doesn’t mean for a minute that his trademark confidence has changed. Combine Woods’ self-assurance with the fact he regained the No. 1 world ranking this year and it should come as no surprise that he is expressing optimism about 2014. "I was pretty consistent throughout the year, starting off at Torrey Pines and ending on a positive note at Sherwood, where I finished second to Zach," Woods posted in a blog on his website. "I think my body of work overall for the whole year was pretty good." The blank spot in Woods’ list of 2013 accomplishments was in trying to win a major. It’s no secret he’s out to catch Jack Nicklaus in career major victories, but has been stuck four behind the Golden Bear for five years. "I’m really excited about the major championships next year. I’ve won at three of the four venues – Augusta National, Valhalla Golf Club and Royal Liverpool — and on Pinehurst No. 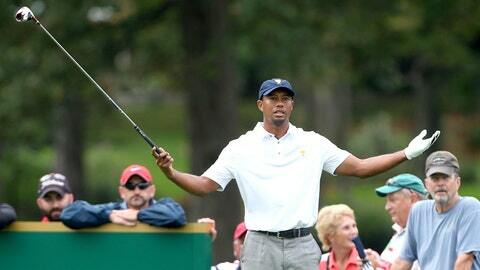 2 (U.S. Open), I’m trending the right way, having finished third and second," Woods said. Woods had opened his post by giving thanks to those involved in his 2013 Northwestern Mutual World Challenge this month, in which he shot 62 and finished second to Zach Johnson – who, Woods pointed out, rose to No. 9 in the Official World Golf Ranking with the win. "First, I want to thank everyone who has been involved with our World Challenge event as we celebrated our 15th and last year at Sherwood Country Club in Thousand Oaks, Calif.," Woods wrote. "The board and members at Sherwood have been great to us over the years. I also want to thank all of the sponsors, volunteers and amazing fans that came out through the years, whether it was perfect sunshine, rain, cold or wind. I’m grateful to all of you for supporting us because the World Challenge helped build our Tiger Woods Learning Center in Anaheim, Calif. It got us the equity we needed to build a tremendous facility that has served more than 100,000 students since 2006. "When we first started the tournament, it was a fun challenge-season event. The small field had a great time, and the event raised funds for my foundation. Now it’s grown into something more serious because of the World Ranking points involved, and we are getting more of the top players to play because of that." *Architecture: "My newest golf course project, El Cardonal at Diamante Cabo San Lucas, is coming along well. I recently made a visit there and was pleased with the progress. It was great to see grass going down on the front nine and shaping happening on the back nine. I’m excited about how it’s turning out." *Equipment: "I also found a new Nike driver, VRS Covert 2.0 Tour, that I’m really excited about. I drove the ball a little further and definitely straighter than I have been all year." *Moving the World Challenge: "Next year, I’m excited to partner with Tavistock to move the World Challenge to Isleworth Golf and Country Club in Orlando, Fla. I’ve played there hundreds of times and lived there for about 16 years. It’s an awesome golf course, probably one of the toughest in the state. I think moving there is going to be fantastic for many reasons. It’s a great opportunity to grow the tournament and my partnership with Joe Lewis and Tavistock. Also, the international golf calendar has changed a lot over the last few years, and there is more pressure on a player’s schedule. So many top players are based on the East Coast, and that makes a tremendous difference in getting a quality field in December. The format will stay exactly the same: 72 holes of stroke play, and my foundation will continue to operate the event." *Taking a break: "I’m going to put my clubs away for a while to spend more time with my kids and support my girlfriend Lindsey Vonn as she tries to prepare for the Sochi Olympics. Having experienced reconstructive surgery on my knee and the ensuing rehab, and the amount of pain associated with it, it’s really hard to explain to anybody unless you’ve been through it. And then coming back on it athletically, to trust that it’s going to be there, that’s a whole different ballgame. I’ve had my share of experiences in that regard â unfortunately â but I think it helps her in a sense because she can bounce ideas off me about what to expect. It is a frustrating process and really difficult to go through." *Stanford football: "What Coach Shaw has done with that program . . . it’s top-notch. It’s not easy to recruit players with intellect and athletic ability, but he has been able to do it. He’s done a helluva job, and it just goes to show you that you can do both. We keep winning that Directors’ Cup every year, and I think that’s a testament that you can be a great athlete and can have a high academic standard as well. Unfortunately, I won’t be able to attend the Rose Bowl, but I already have a place picked out to watch it."